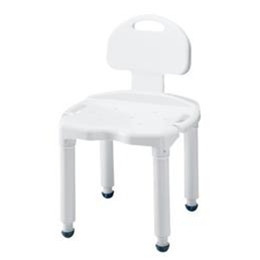 Made of durable plastic Supports up to 400 lbs Maximum height 35”. Adjustable seat height 18” – 23” Seat 21” W x 18” D Assembles in seconds, no tools required. 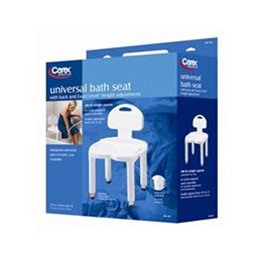 The Carex Universal Bath Bench with Back, #B671C0, can support up to 400 lbs and features an innovative design for comfortable seating. It features our patented Exact Level height adjustment. It can be easily assembled with no tools required and fits into most tubs or showers - whether at home or away. It also includes a convenient notch for holding a hand-held shower spray and drainage holes to prevent water pooling.